A former Tory premier was coy Thursday night about his own political future. 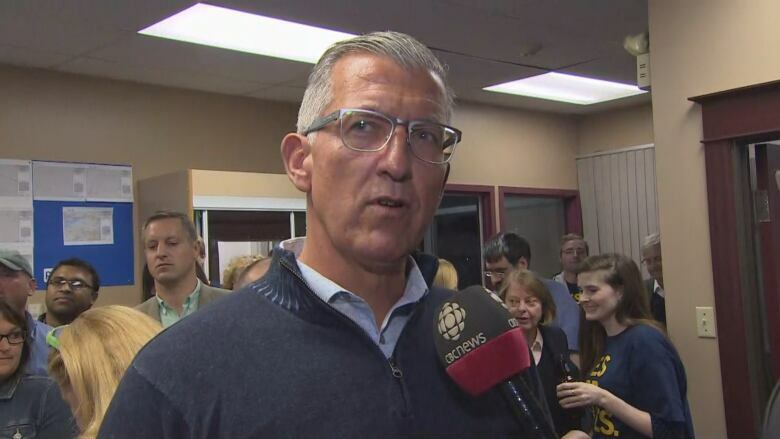 Former Tory premier Paul Davis was coy Thursday night about his own political future, leaving the door open for a run at a federal seat in next year's election — while not ruling out another provincial run, either. Davis, while appearing at Ches Crosbie's campaign headquarters in the Windsor Lake byelection, told CBC's Anthony Germain he is not ruling anything out, and was open to a federal run. "Anything's a possibility," Davis said about his own political future. "Yeah, there's a future ahead in politics. I don't know what my role is going to be." Davis, who led the provincial Tories to defeat in the 2015 general election, stepped down as party leader earlier this year, paving the way for a leadership contest that Crosbie won in April. Davis acknowledged he has an eye on federal politics. "I got to know Andrew Scheer when I was leader and he became leader, and worked closely with Rona Ambrose before that," referring to the former interim leader of the Conservative Party and Opposition Leader. "I think it's very, very important for us to try and tighten and improve on those relationships." Davis, when asked again, didn't give a definitive no when asked about the possibility of running next year in the provincial election. Both the federal election and provincial election are scheduled for the fall of 2019. "As a provincial politician I've always taken the approach that for me Newfoundland and Labrador, and Newfoundlanders and Labradorians always come first." Davis said he for the most part stayed away from the byelection campaign, but offered his help each time he was asked, knocking on doors with other caucus members. "We had a good time, it was a good time for us. I always enjoy campaigns and meeting people, listening to their concerns and talking to them about politics of the day," Davis said. "We did that as a caucus over the last few weeks and I think it was a good experience for us as well."